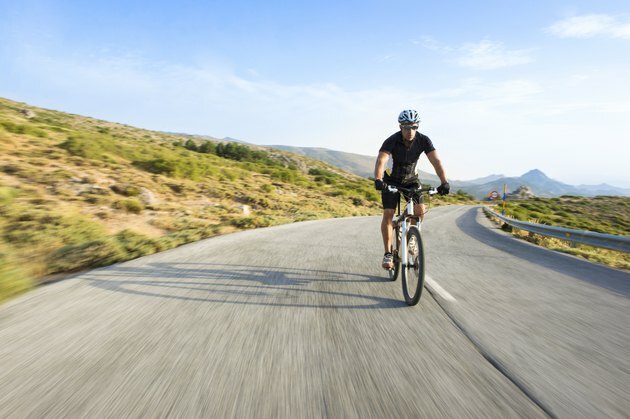 Cycling is a high-intensity endurance sport that requires massive amounts of calories, carbohydrates and fat. To maximize your cycling performance, eat a healthy diet rich in fresh fruits, vegetables, whole grains and lean meats. In addition, consider taking supplements especially beneficial for cyclists. Before taking any new supplement, check in with your doctor to make sure it's safe for you. People who exercise intensely require more dietary protein than their couch-potato counterparts, reports Colorado State University extension. Intense cycling works and breaks down the muscles of the calves, quadriceps and hamstrings. To recover and grow, those pedaling muscles need adequate dietary protein. Diet should be the primary source of protein in the form of healthy sources like lean chicken, fish, beans and low-fat dairy. In addition, whey protein may bolster recovery efforts after training or competition. Michael Saunders of the American College of Sports Medicine investigated the effects of a whey protein- and carbohydrate-rich beverage on cyclists who had just finished a workout. In research published in the August 2004 issue of "Medicine & Science in Sports & Exercise," Saunders reports that the protein-carbohydrate combination shortened recovery time allowing the cyclists to work harder during their next workout. Many cyclists will tell you that keeping pace throughout an entire grueling race is the most challenging aspect of competitive cycling. Fortunately, taking green tea extract may allow you to stay stronger for longer, according to the American Physiological Society. In fact, taking high doses of green tea extract can boost endurance by 25 percent. The society reports that green tea frees body fat for energy use which prevents cyclists from hitting the wall. Have you ever woken up the morning after a tough ride and felt your legs cry in pain as your feet hit the floor? If so, you're likely suffering from delayed onset muscle soreness, a common and painful side effect of intense cycling. M.S. Bryer of the University of North Carolina Greensboro reports in the June 2006 issue of the "International Journal of Sports Nutrition and Exercise Metabolism" that supplementing the diet with 3 g of vitamin C per day significantly reduced post-exercise muscle soreness.